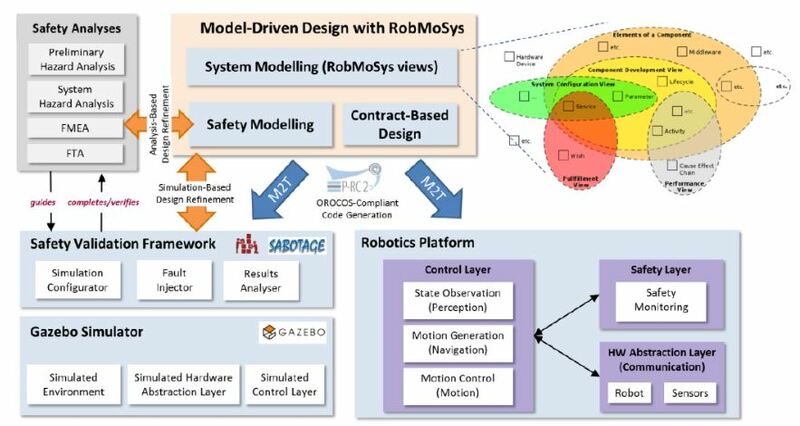 Extension of the RobMoSys metamodel to include safety concerns and support contract-based design. As a result, a safety view will be provided. The currently implemented solution is based on a Papyrus/SysML profile. However, it can be easily adjusted to work with Papyrus/RobotML or as a separate ecore-based editor. Tools to generate ROS/OROCOS compliant code to run on real demonstration systems. Creation of run-time monitors for safety assessment. By providing formal safety specifications, monitors can be automatically generated and incorporated in the system to ensure the safety of robots. A tool enabling an early safety assessment of robotics systems, starting from the Sabotage simulation-based fault injection framework will be developed. Fault injection simulations will be used for testing the architecture´s robustness and to perform an early dependability/safety validation. The area of Fault Injection is mainly concerned with simulation-based analysis of a system’s safety or its dependability properties. Due to its simulative approach, failure characteristics of system components should be modeled as realistically as possible to obtain reliable results. Failure modeling of different components such as sensor failures will be tackled. Sabotage, Gazebo for robot dynamics and environment simulation, and the integration with the RobMoSys design platform will be performed. Furthermore, possible integration to model-based safety analysis tools such as SOPHIA will be further investigated. The eITUS building blocks integrate existing technologies from RobMoSys, P-RC2 (Platform for Robot Controller Construction) and AMASS (Architecture-driven, Multi-concern and Seamless Assurance and Certification of Cyber-Physical Systems) projects. 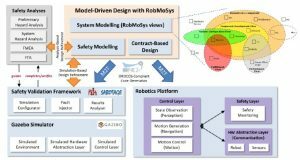 RobMoSys will provide the core technologies for modeling robotics systems using the different metamodels underlying the RobMoSys views. P-RC2 will provide a framework for the functional design of the robot controller with component development and system configuration views. It will additionally provide tools for code generation from these views. AMASS will provide the metamodeling backbone for safety validation by providing a safety modeling view for both safety analyses and simulation-based fault injection.